Wes Anderson has always loved stop-motion animation, which has been used in several of his live-action films, as well as his animated take on Roald Dahl’s Fantastic Mr. Fox. Now he’s returning to the medium for the idiosyncratic Isle Of Dogs. I should probably start off by saying I’m generally not a great fan of director Wes Anderson. I’ve found most of his films far too pleased with themselves and so obsessed with their own quirkiness that it actually got in the way of the film rather than enhancing it. While Wes Anderson’s is a bit of a love him or be bored by him director, there’s no doubt a lot of people adore his quirky, eccentric movies – and that includes a lot of famous names, who are happy to show up to appear in his flicks. Indeed, he’s almost got his own repertory company with names such as Owen Wilson, Bill Murray and Ed Norton, who are all back for The Grand Budapest Hotel. Now a new trailer has arrived, giving us a look at that cast, along with a poster that does the same. Wes Anderson is lining up an even more impressive cast than usual for his next movie, The Grand Budapest Hotel, with Tilda Swinton, Adrien Brody, and Edward Norton joining the project. Jeff Goldblum, Harvey Keitel, Willem Dafoe, F. Murray Abraham, and Mathieu Amalric have also been confirmed to star. Bill Murray, Ralph Fiennes, Jude Law, Owen Wilson, Jason Schwartzman, and Saoirse Ronan had previously been confirmed to star. 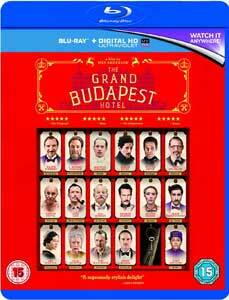 The film takes place 85 years ago in a Hungarian hotel and should start shooting early next year. Saoirse Ronan hasn’t really done much in the world of comedy, but she’s going in that direction, even if Wes Anderson doesn’t create your usual type of comedies. Variety reports that Ronan has signed on for a major role in Anderson’s The Grand Budapest Hotel. No details have been revealed about actress’ character, but that’s not surprising as Anderson has been keeping the plot of the movie under his hat. All that is known about the story is that it is set 85 years ago in a Hungarian hotel. It’s said the film is inspired by classic movies from the likes of Billy Wilder and Ernst Lubitsch. Bill Murray, Ralph Fiennes, Jude Law, Jason Schwartzman, and Owen Wilson are all attached to star, with production is scheduled to begin next year in Germany. Over the years Wes Anderson has built up a trusty stable of actors, such as Jason Schwartzman and Bill Murray, who he’s used over and over again, but that doesn’t mean he won’t use new actors. Ralph Fiennes is an Anderson newbie, but he’s just signed up to work with the director on his new movie, Grand Budapest Hotel, according to Variety. The actor will play M. Gustave, the ‘perfectly composed concierge’ who works in the titular hotel. Wes Anderson confirmed last month that Bill Murray is starring in an unspecified role, although he also debunked a rumor that Johnny Depp will be involved. The filmmaker has also been reported to recruit Jude Law and Angela Lansbury to star. Wes Anderson is directing from his own original screenplay. It isn’t known when production will begin. After the box office success of Moonrise Kingdom, which has earned $44 million worldwide from a $16 million budget, director Wes Anderson is going right back to work on his new project. The filmmaker has secured Johnny Depp to star in his new ensemble drama entitled The Grand Budapest Hotel, which is likely to Wes’ next movie, according to Deadline. No story details have been released, although Twitch has rumours on that indicates more actors the director is going after. Moonrise Kingdom stars Edward Norton and Bill Murray are on the list of both Anderson regulars and newbies, along with Owen Wilson, Jude Law, Jeff Goldblum, Adrien Brody, Willem Dafoe, and Angela Lansbury. No shooting schedule is known, although it is believed to be Johnny Depp’s next movie, after production wraps on The Lone Ranger. While we got Fantastic Mr. Fox in 2009, we haven’t had a live action movie from Wes Anderson since The Darjeeling Limited in 2007. However he’s back soon with Moonrise Kingdom. We had a trailer for the movie a few weeks ago, and now a very charming poster has emerged, which comes at the same time as Variety confims the movie has bagged the prestigious opening gala spot at this year’s Cannes Film Festival. Moonrise Kingdom takes us back into a world of Anderson’s whimsy and eccentricity, with plenty of stars along for the ride, including Edward Norton, Bruce Willis, Bill Murray, Frances McDormand, Tilda Swinton and Jason Schwartzman. Set on an island off the coast of New England in the summer of 1965, Moonrise Kingdom tells the story of two 12-year-olds who fall in love, make a secret pact, and run away together into the wilderness. As various authorities try to hunt them down, a violent storm is brewing offshore, and the peaceful island community is turned upside down in more ways than anyone can handle. It should be in cinemas this summer. I’m never sure whether I like Wes Anderson movies or not. I think it’s probably most accurate to say that I’m bemused by them. However he has a lot of devoted fans who’ll be looking forward to his next effort, Moonrise Kingdom. From this first trailer, it seems we’re back into a world of whimsy and eccentricity, with plenty of stars along for the ride, including Edward Norton, Bruce Willis, Bill Murray, Frances McDormand, Tilda Swinton and Jason Schwartzman. Set on an island off the coast of New England in the summer of 1965, Moonrise Kingdom tells the story of two 12-year-olds who fall in love, make a secret pact, and run away together into the wilderness. As various authorities try to hunt them down, a violent storm is brewing offshore, and the peaceful island community is turned upside down in more ways than anyone can handle. Bruce Willis plays the local sheriff. Edward Norton is a Khaki Scout troop leader. Bill Murray and Frances McDormand portray the young girl’s parents. It should be in cinemas this summer.